Hello!! 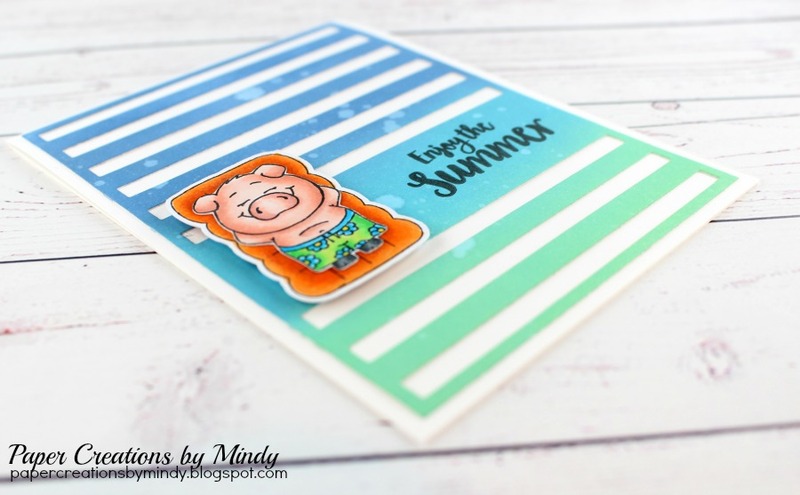 I’m super excited to be Guest Designing for Gerda Steiner Designs for this super cute Pool Piggies stamp set! There are so many super fun summer cards I have in mind! My first card is with a fun distressed background. I used my Tim Holtz distress inks but this background was one of a few that I was experimenting with and unfortunately forgot to write down my colors. Lesson learned! If I were to venture a guess, I would say I used Cracked Pistachio, Broken China and Faded Jeans. I diecut the distressed background with my Striped Sentiment Strip Die to create the white lines. I thought it broke up the background nicely. I colored up my cute piggie and raft and cut them out with my Scan N Cut machine then pop dotted it onto my card front.